The I, IV, V chord pattern is a very common progression, and it is for that reason I will be focusing on it for several lessons. If you have an interest in blues, rock or jazz music, this will form the basis for many songs you will learn, (especially in the case of the blues). By the end of this lesson, I hope you will be able to play a Maj or Min I, IV, V chord pattern, and understand the theory behind them. I believe these progressions are so common largely because they are simple to learn. If you want to play a Major I, IV, V pattern, you only have to know Major chords. Similarly, if you want to play a Minor I, IV, V, you will be playing only Minor chords. The second reason they are common is that you will be using every chord of that type available in the scale. For instance, the Major version will contain every Major chord of that given scale. Likewise, the Minor I, IV, V will contain every Minor chord of that scale. To reiterate, if you play a I, IV, V pattern in either Major or Minor, you will be using every chord of that type in the scale. A further advantage of these progressions is that you only need to know the root note of the song. Most of the time, when playing a I, IV, V pattern I’m only thinking about the root note of the scale, because it’s not necessary to know the names of the other chords, provided you know you’re sticking in the right key. First off, I want you to play a G Major scale, and take note of the first, fourth and fifth notes are, (this only works with the full scale, so if you’re only familiar with the Pentatonic scales, now would be the time to go and learn the full ones). The first, fourth and fifth notes are going to be the root notes of your I, IV, V progression. Once you’re comfortable playing these individually, try these various structures, (I’ve written out the chords, but titled each exercise as the scale degrees you’re using). Play the same chord progressions above as open chords instead of barre chords. 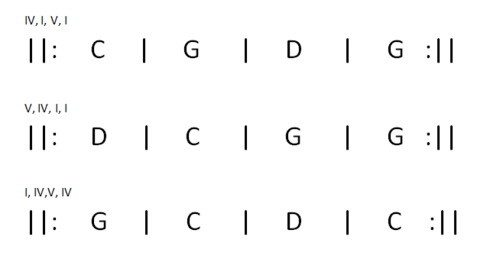 Play these patterns in different keys. Shifting the entire pattern up 2 frets will give you A Major I, IV, V patterns. Shifting it down to the first fret will give you F Major I, IV, V patterns.